If you’re looking for the most comprehensive Zinus mattress review to determine if you should purchase from this brand, you’ve found it! While not the longest standing mattress brand out there, it’s one that has made a name for itself quite rapidly. This is not only due to great quality but also quick shipping and longevity. If you are thinking about buying from this brand yourself, then take a look at the information below to learn more about what to expect. From comfort on the edges to the different types of mattresses available, this will prepare you with all you need to know before buying. -What Types of Mattresses are Available? -Should You Buy a Zinus? Mr. Youn Jae Lee first started his business in 1979, building high-quality tents for the outdoors. Then, in 2004, he shifted Zinus to an indoor mattress company using his knowledge and experience in the comfort industry. A short two years later Zinus’s compression packing and “SmartBase” was created, with “BioFoam” coming the year after. Over the years this company has continued to introduce innovative comfort technology, such as patented gel infusion and Eco Foam. Now, there are distribution centers located throughout the country and many more planned for China in the coming years. As you can see, the hybrid beds are designed with both springs and memory foam. This gives you the best of both worlds and can help provide you with more support at night, as well. This is available in 6″, 8″, and 10″ mattress sizes and begins with an innerspring support system. This is followed by two separate layers of Viscolatex foam and topped off with high-density foam for added support.See the mattress. This is available with thickness levels of either 10″ or 12″ and begins with a layer of high density foam for a supportive base. This is followed by several inches of the iCoil springs that are topped with high-density foam. This is then followed by a layer of comfort foam and gel memory foam that’s soft, cozy, and supportive.See the mattress. This bed is available with thickness levels of either 12″ or 13″ and starts off with the brand’s own iCoil pocketed springs. On top of this is high-density foam, comfort foam, and a top layer of additional high-density foam to create the best pressure relief possible as you rest.See the mattress. With a thickness level of 10″, this mattress is soft yet firm so you get strong support rather than a plush feel. It’s made with a base of the brand’s iCoil pocketed springs that’s topped with high-density foam. On top of this is a layer of comfort foam followed by a top layer of additional comfort foam that provides incredible comfort.See the mattress. You can choose between thickness levels of 8″, 10″, and 12″ if this is the mattress you go with. The design begins with a base of high-density foam that’s followed by comfort foam and memory foam. The mattress is finished with a layer of quick response foam and micro-fiber padding for a cloud-like feel.See the mattress. 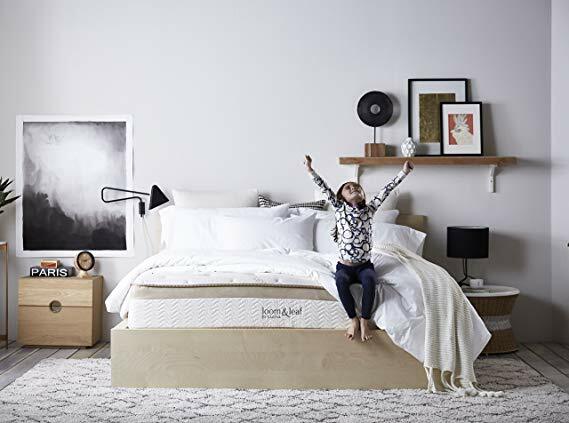 This mattress is available in thickness levels of 8″, 10″, 12″, and 14″ and is designed for a plush feel with cooling technology for less heat buildup at night. The design includes a base of high-density support foam with comfort foam and gel memory foam at the top. With so much memory foam, this is one of the softest beds available.See the mattress.See the mattress. This nice smelling mattress is available in thickness levels of 6″, 8″, 10″, and 12″. It begins with a base of high-density support foam that’s followed by an additional layer of high-density foam. On top of this is a layer of comfort foam and one more layer of soft memory foam. With green tea infused into the foam, this should smell great from the time you go to sleep until the time you wake up. Zinus provides you with a 100-day trial in order to determine if your mattress is the right one for you. If you aren’t happy with it, you can return within that 100-day period for a full refund. This is on-track with most other mattress brands today, so it can give you confidence with your purchase knowing you’re covered if you happen not to like it. However, keep in mind that Zinus does say the mattress must be returned in good condition with no stains. If you are purchasing from Amazon, speak with a customer service rep to confirm returns process. Aptly named the “Zinus handshake”, the warranty from this company covers mistakes in manufacturing. It lasts for 10-years total and will specifically cover any defects due to manufacturing mistakes. To claim this warranty, you’ll have to contact the company and make sure you have your proof of purchase ready. If you want peace of mind knowing that you have coverage in case manufacturing mistakes are made, then this is an important piece of your purchase. It’s certainly long enough so that you’ll have coverage over the time you own the mattress. According to most buyers, yes! Zinus has great reviewsfor comfort, especially since they have a variety of different mattresses to choose from. Even those who prefer a bed that’s more firm are satisfied with the beds that come with springs. However, the plush memory foam seem to be the most popular and have some pretty great reviews from those who have bought. If you are looking for a bed that you can fall asleep on without constantly waking up, this is a top contender. Since transparency in this Zinus mattress review is important, we’d like to note that edge support with this bed isn’t as strong as it is with other mattresses. However, it does stand firm when you lie on it at night, so it’s not something that should bother you if you sleep in the middle of the bed. The edge support with the spring mattresses from Zinus tend to be the best, so you may want to consider those if you prefer stronger support. However, the best way to tell if the edge is supportive enough for you is by trying it out! If you look online, Zinus has thousands of great reviews from those who have purchased from the brand. While it’s easy to find negative reviews, it’s important to note that some are due to issues that may not be concerns for you, such as the returns process. Like with any purchase, it’s important to read both positive and negative reviews to get a better idea of what you can expect with the mattress yourself. When it comes to the good reviews, most people say that the bed is comfortable, the customer service is good, and the price is even better. Yes. Zinus mattresses are some of the most affordable on the market today, which make them a solid choice if you’re on a budget. What’s even better is that shipping is almost always free, which can help make it an easy choice to save money. If you were to compare one of these mattresses to luxury brands, you’ll find that the price is vastly different although the quality is comparatively the same. Zinus mattresses are compressed and then shipped out in boxes, which is similar to most other mattress brands today. The biggest benefit of this is the fact that it’s much easier for you to move around your house and place where you’d like it to go. In most cases, it takes just a few minutes to take the mattress out of the packaging and allow it to fluff up. You will have to wait a little while to lie on this until it airs out, but this is the case with most other brands of mattresses today as well. You can order Zinus mattresses straight from the manufacturer via their website. However, this is not your only option. Zinus is also available on Amazon.comand is one of the most popular mattress options available for sale. One of the best things about ordering via Amazon is their excellent customer service and the chance to read quite a few reviews. What’s even better is that your address and payment information is likely already stored if you have an account. If you have any questions about making the purchase, you can call Amazon or chat with them directly on their site for added convenience. Just like with any mattress, it’s crucial to review the pros and cons before you click the “buy” button. This will help ensure you’re making the right purchase for yourself. To help make this Zinus mattress review the best, we’ve gone ahead and listed the pros and cons here for you. If you want a high-quality mattress that isn’t going to break the bank, then this is it. It’s one of the most affordable mattresses on the market today. Shipping is generally fast with this brand, and because they ship in a box, you can easily place the bed where you’d like it to go. The design of this bed is unique and there are several options to choose from. With different options, you’re more likely to choose a bed that suits your preferences the best. These mattresses isolate motion pretty well, which means you are less likely to wake up if you’re next to someone who tosses and turns. The materials on these beds tend to offer excellent support, which can mean less pain when you wake up in the morning. You’ll have to wait from 4-8 hours for the mattress to expand after you take it out of the box and wrapping. Some buyers have reported a chemical smell after they take the bed out of the box, which can take a few days to subside. Some of the parts used in these beds aren’t made in America. Should You Buy a Zinus? Overall, this Zinus mattress review has found more positives than negatives when it comes to the beds available from this brand. Ultimately, this makes it a great choice if you want something that’s affordable and comfortable. What’s even better is that you can find it on Amazon so it’s very easy to order and you can read through reviews before you make the investment. With all of that being said, which mattress is right for you? If you like something more firm, go for the spring bed. If you like something a bit softer, than the memory foam is likely the best option for you.